If you’re going to be in charge of what is considered the Bible of Louisiana civil law, it helps to learn from the master. That’s just the path Tulane Law Professor Ron Scalise (L’00) took as the new editor of the 2019 Louisiana Civil Code, Volumes I and II, which was published this month and is used by the state’s legal community as the definitive book on civil law, including family law, property rights, successions, contracts, torts, and other areas of private law. Thousands of copies are distributed each year globally, including to students, academics, attorneys, judges and anyone who has to understand civil law. Scalise is a former student of and long-time collaborator with A.N. “Thanassi” Yiannopoulos, the Eason-Weinmann Chair Emeritus at Tulane Law until his death in 2017 and the man who in 1968 began revising and reshaping major parts of Louisiana’s civil code, by then almost irrelevant in case law. “Thanassi served as the editor of West’s Louisiana Civil Code for almost 40 years, and to be standing and filling those shoes is a deeply humbling experience for sure,” said Scalise, the John Minor Wisdom Professor of Civil Law. Louisiana operates on a civil law system, historically used in France, Spain and ancient Rome. Every other state uses the English common law system. Civil law emphasizes the content of legislation rather than precedent or judicial interpretation. Scalise took over as the publication’s editor in 2018, keeping changes minimal as he established his own process and style. But in the latest edition, he took more liberty to revise, update, and expand the editorial content where he saw a need. Scalise collaborated with Yiannopoulos for many years starting in 2010 when they co-taught a civil law seminar. 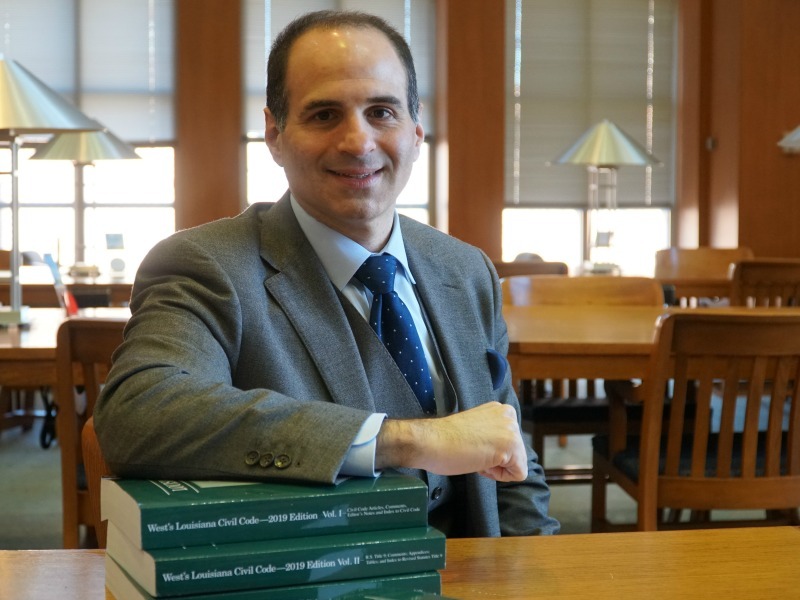 Over time, he took over other publications and scholarly work from Yiannopoulos and now provides annual supplementation and updates for five volumes of the Louisiana Civil Law Treatise. That the editing, rewriting and formulation of the state’s civil law code has been in the hands of a Tulane Law School professor for almost 40 years is significant, said Law Dean David Meyer. Scalise joined the Tulane Law faculty in 2009 and held the A.D. Freeman Professorship from 2009 to 2018. He served as Vice Dean of the law school from 2012 to 2016. Prior to arriving at Tulane, Scalise served on the faculty of the Louisiana State University Law Center from 2004 to 2009. In 2007, he was awarded the McGlinchey Stafford Associate Professorship there, and, in 2009, he served as Acting Vice Chancellor for Academic Affairs.